According to Maryland State Police, five children were killed in an early morning crash that took place in Prince George's County. BOWIE, Md. 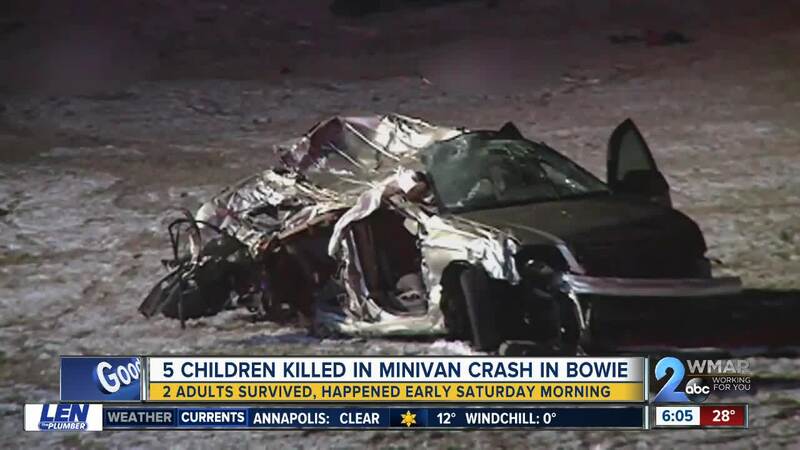 — According to Maryland State Police, five children were killed in an early morning crash that took place in Prince George's County. Shortly after 5 a.m., on Saturday, the Prince George's County Fire Department informed the Maryland State Police Forestville Barrack of a reported vehicle crash on northbound Route 301, in the area of Pointer Ridge Drive. When troopers arrived they discovered that one vehicle, with multiple victims, was involved and an extensive crash site. As a result of that, all lanes of northbound Route 301 were closed for rescue and investigation purposes. The preliminary investigation, which was conducted by The Maryland State Police Crash Team, indicates that a 2005 Chrysler Pacifica was traveling northbound on US Route 301 with five children and two adults. For reasons that are currently unknown, the Chrysler traveled off the left side of the road and into the wood line that's along the highway. Evidence shows that the vehicle struck several trees and then began to spin in a snow covered field. All five children were ejected from the vehicle. Both adults were taken to UM Prince George's Hospital Center where they are currently being treated for their injuries. Based on evidence, investigators believe that the driver and passenger were both wearing seat belts. However, they also believe that the five children had not been properly restrained at the time of the crash. The children are believed to had been positioned in the rear seats of the vehicle. The children have been identified as 8-year-old Landon Dixon and 5-year-old Paris Dixon, both of Bowie; and 14-year-old Zion Beard, 6-year-old Rickelle Ricks and 15-year-old Damari Herald, all from Washington, D.C. The two adults have been identified as 32-year-old Dominique R. Taylor, of Bowie and 23-year-old Cornell D. Simon, of Oxon Hill. Taylor was the driver and Simon is believe to have been the passenger. The cause of the crash has not been determined at this time, but nothing has been ruled out as a possible cause or contributing factor.